Albert James Cook was born on 8 December 1865 at 3 Court, Ryland Street in Birmingham, Warwickshire, the fourth of the five children of John and Emma Cook. The census of 1871 shows the family as living at 141 Sherborne Street, Ladywood, Birmingham. They are at the same address in the 1881 census which also shows that Albert is employed as a Warehouse Boy at that time. Albert married Emma Thomas at Stafford Presbyterian church on 24 December 1886. Albert's surname was shown as Cooke on the certificate although his birth certificate had shown it as Cook. His address was given as being 6 Isaac Walton Street, Tillington, Stafford. 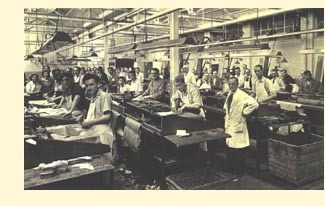 At the time of his marriage, Albert was employed in the manufacture of shoes in Stafford as a clicker, who was the person who cut the shoe leather into shape. This was a responsible job as he had to select the best way to cut the leather to minimise waste. He also had to consider the effect of the colour, grain and weight of the leather on the design and function of the finished shoe, and ensure that each pair of shoes matched. The clicker would cut from a pattern using a knife which had a curved blade, rather like a bird's talon, and each man made his own blades to suit his preference. The shape of blade would vary for different thicknesses of leather. The clicker worked on a board made of wooden blocks with the end grain upwards and the term 'Clicker' is said to come from the sound that the blade made as it crossed the joints in the wood. Albert and Emma's daughter Gertrude Bentley Cooke was born on 25 September 1887 at 8 Lime Tree Avenue, Tillington Street, Stafford. Albert was only 24 years old when, on 22 July 1889, he died of a lung disease at 30 Devonshire Street, Leicester.